Policing, Third Edition, provides an affordable, thought-provoking look at policing that uses clear writing and eye-catching visuals to get your students straight to the important concepts. By focusing on these core concepts, students will gain true understanding of the material, without becoming overwhelmed with unnecessary information. The book's conversation-starting pedagogy encourages active participation in learning, moving students beyond memorization by engaging them in the latest research findings and current events shaping the field. 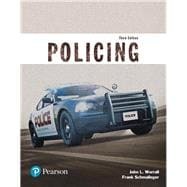 Policing, Third Edition, is also available via Revel™, an interactive learning environment that enables students to read, practice, and study in one continuous experience. John L. Worrall is professor of criminology at the University of Texas at Dallas (UTD). A Seattle native, both his M.A. (criminal justice) and Ph.D. (political science) are from Washington State University, where he graduated in 1999 From 1999 to 2006, he was a member of the criminal justice faculty at California State University, San Bernardino. He joined UTD in the fall of 2006. Dr. Worrall has published articles and book chapters on topics ranging from legal issues in policing to crime measurement. He is also the author or coauthor of numerous textbooks, including Introduction to Criminal Justice (with Larry J. Siegel, 16th ed., Cengage, 2018) and Criminal Procedure: From First Contact to Appeal (5th ed., Pearson, 2015). He is also editor of the journal Police Quarterly. Frank Schmalleger, PhD, holds degrees from the University of Notre Dame and Ohio State University, having earned both a master’s (1970) and a doctorate (1974) in sociology with a special emphasis in criminology from Ohio State University. From 1976 to 1994, he taught criminal justice courses at the University of North Carolina at Pembroke. For the last 16 of those years, he chaired the university’s Department of Sociology, Social Work, and Criminal Justice. In 1991, he was awarded the title Distinguished Professor, and the university named him professor emeritus in 2001. Dr. Schmalleger is the author of numerous articles and many books, including the widely used Criminal Justice Today (Prentice Hall, 2017), Criminology Today (Prentice Hall, 2018), Criminal Law Today (Prentice Hall, 2016), and The Definitive Guide to Criminal Justice and Criminology on the World Wide Web (Prentice Hall, 2009). He is also founding editor of the journal Criminal Justice Studies. He has served as editor for the Prentice Hall series Criminal Justice in the Twenty-First Century and as imprint adviser for Greenwood Publishing Group’s criminal justice reference series.